An Early Medieval Experience for CA Volunteers! As part of our busy work experience programme, two students from local schools were treated to a talk from our post-excavation processor, Claire Collier. Claire is a member of Regia Anglorum, an early medieval re-enactment and living history group. The group aims to reenact as accurately as possible the lives of people from a cross-section of English society at around the turn of the first millennium AD. The group’s watchword is ‘authenticity’ and they will not make any item of kit that they cannot verify from contemporary sources. All aspects of life are portrayed by the group, ranging from the lowly baker to the mighty warrior. The students were shown reconstructed items used in everyday early medieval life, including clothes and dress accessories. They also learned about the early medieval diet, handling objects associated with eating and drinking such as wooden bowls and ceramic and horn cups. 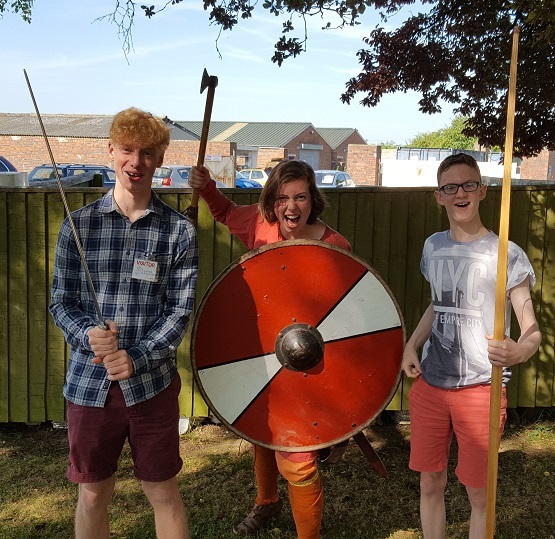 They were also able to handle weapons which have been reconstucted based on archaeological finds of Anglo-Saxon, Viking and Norman arms, including a sword, axe, mace and bow and arrow.